Newly leaked public information reveals that, in its pre-IPO presentation to investors, Bitmain provided insight into its cryptocurrency holdings, which shows that Bitmain unloaded most of its bitcoin (BTC) to accumulate bitcoin cash (BCH) in its stead. 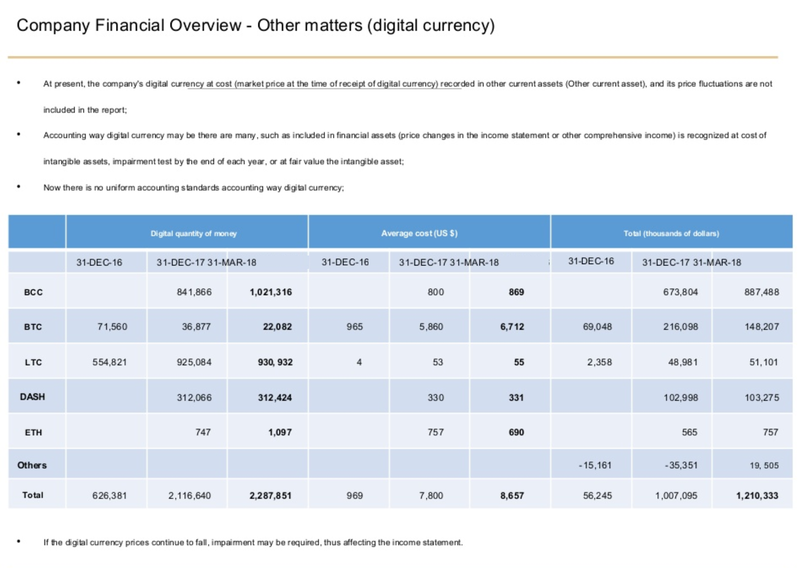 In a snapshot of a slide from the original presentation, the leftmost column titled “Digital quantity of money” shows Bitmain’s bitcoin supply decreased from 71,560 BTC to 22,082 from December 2016 to Q1 2018. Over the same period, its BCH holding increased to over 1 million coins. Samson Mow, CSO of Blockstream, pointed out that Bitmain has incurred half a billion dollars in losses through its BCH holdings over the last three months alone. Scrutinizing the company further, Mow pointed out that Bitmain chose not to disclose financial data for its Q2 inventory in 2018. The tweet by Mow brings to light that Bitmain reported $1.24 billion in inventory for Q1 2018, while it has not mentioned any numbers for Q2 despite already being well into Q3, raising speculation that Q2 was omitted because the company may have realized a loss between $600-700 million. In a recent Medium blog post, a pseudonymous blogger by the name of Crypto Herpes Cat points out that these losses, and the lack of transparency surrounding its reporting, could have an impact on Bitmain’s forthcoming IPO. All this could spell concern for Bitmain’s current and potential investors, although some investors have still expressed continued support for the company despite the recent debacle. Another part of Bitmain’s business is also struggling thanks to increased competition from competitors like GMO, Avalon and Ebang, who have started producing more efficient chips than the 16nm ones that Bitmain’s S9 miner uses, according to Crypto Herpes Cat. Market saturation and an overall decrease in demand for miners during the prolonged bear market has caused Bitmain, the largest Bitcoin mining hardware company, to incur what may be a substantial loss on its balance sheet. For instance, the antminer s9, Bitmain’s latest and most sophisticated ASIC, once sold for $3,500; now, it’s selling for $700 — a decline of over 80 percent. The majority of Bitmain’s value, however, is derived from its treasure trove of crypto assets like bitcoin cash, as well as future cash flows from selling mining equipment. During the bull market that saw bitcoin rise to almost $20,000, the same speculative demand that drove prices and mining interest fueled the majority of Bitmain’s business. But since bitcoin’s price has retreated some 70 percent from its all-time highs, the demand for ASIC miners has decreased as well. Through multiple funding rounds in 2017 and 2018, Bitmain witnessed its valuation balloon to $12 billion, and its IPO valuation has it figured upward of $40 billion. Now, there is some speculation as to the motives behind Bitmain’s IPO, including suggestions that they may be providing a way for Bitmain to right the ship by offloading onto retail investors. Since Bitmain’s value was derived from its speculative business strategies, its IPO may be a way to sell part of its company at the high valuation they earned during the bull market, Crypto Herpes Cat suggests. Bitmain’s support for Bitcoin Cash has lined up with its narrative since the original hard fork in August 2017. Jihan Wu, CEO and co-founder of Bitmain, has sat alongside proponents like Roger Ver in defending it as the future of Bitcoin and money. More than this, as an unofficial continuation of Bitmain’s “BIP148 contingency plan,” Bitcoin Cash was effectively initiated by Bitmain, while Bitmain-affiliated mining pool ViaBTC realized the coin by mining its first blocks. Between ViaBTC and its other proxy mining pools, Bitmain supported and mined bitcoin cash from its inception, accumulating a large number on top of what it had already received during the fork. Bitmain has not responded to Bitcoin Magazine’s request for comment at this time.